If you are a Massachusetts commercial trucker engaged in intrastate commerce take note: Effective September 1, 2018, you must obtain and display a US DOT number for designated vehicles. The number must be obtained and filed with the Federal Motor Carrier Safety Administration (FMCSA) and made visible on vehicle markings by that date, as per 540 CMR 2.22, the Commercial Marking section of the Registry of Motor Vehicles regulations. 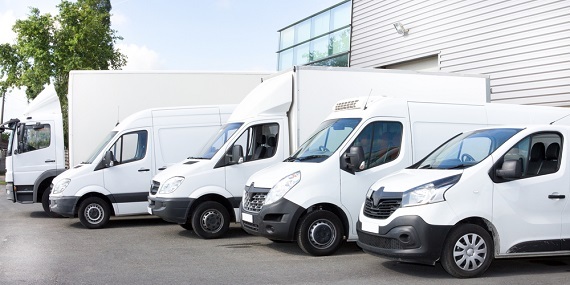 What MA commercial vehicles does this affect? Note: Intrastate operation means you conduct business solely within Massachusetts. How do you obtain a US DOT number? According to the MA State Police, to obtain a USDOT, go to the FMSCA website. Follow links to obtain an intrastate USDOT number. Your company will be issued a USDOT number that must be displayed on all CMVs that your company operates, including leased vehicles. There is no charge to obtain this number from the USDOT-FMCSA. What are the new rules about DOT markings? Don’t let last week’s snow fool you – it’s just about time to take that motorcycle out of mothballs and get it on the road. But first, before you do anything else, check to be sure that you have motorcycle insurance to protect that investment. “Most states require motorcyclists to carry a minimum amount of liability insurance, to cover bodily injury and property damage costs caused to other people involved in an accident. In addition, uninsured/underinsured (UI/UIM) motorist coverage is recommended, or even required, in many states as part of a motorcyclist’s policy to cover expenses for damage were caused by another driver who either does not have insurance, or whose insurance is inadequate. We think its a good idea to have some of the optional coverages, too: collision, first party medical coverage, emergency road service and coverage for customization and equipment. III offers more details on motorcycle coverage here with tips on saving money such as a lay-up policy or those who suspend use in the winter and multibike discounts. The Motorcycle Safety Foundation (MSF) is an internationally recognized developer of the comprehensive, research-based, Rider Education and Training System (RETS). Some insurers offer discounts for certified safety training so check to see if your insurer does. In addition to courses, MSF offers many free resources in their online library. 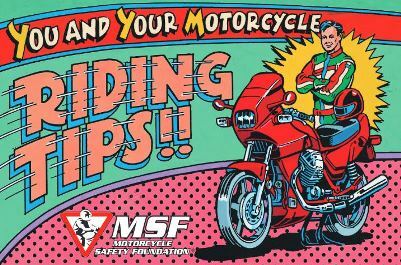 One we like is the booklet You and Your Motorcycle Riding Tips – MSF says that many manufacturers include this booklet with their new motorcycles. They also have similar booklets for 3-wheeled motorcycles and scooters. Their Tire Guide looks pretty handy, too. The American Motorcyclist Association has a good resource on motorcycle laws by state. The guides cover information like eye protection, handlebar height, lane splitting and other information that bikers need to know. BikeBandit offers some excellent tips on how to prep your motorcycle for spring – he touches on everything from batteries to fluids.